1. 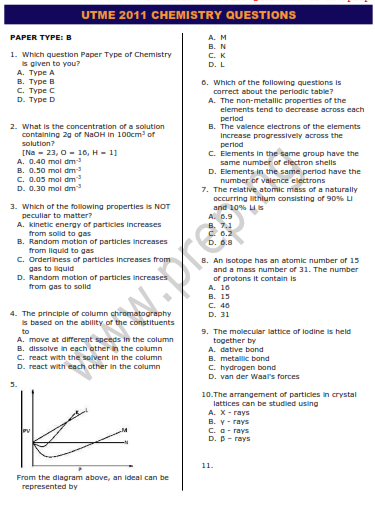 Which question Paper Type of Chemistry is given to you? 2. What is the concentration of a solution containing 2g of NaOH in 100cm3 of solution? 3. Which of the following properties is NOT peculiar to matter? 4. The principle of column chromatography is based on the ability of the constituents to __. 5. From the diagram above, an ideal can be represented by __. 6. Which of the following questions is correct about the periodic table? 8. An isotope has an atomic number of 15 and a mass number of 31. The number of protons it contain is __. 9. The molecular lattice of iodine is held together by __. 12. The importance of sodium aluminate (III) in the treatment of water is to __. 13. What type of bond exists between an element X with atomic number 12 and Y with atomic number 17? 14. Hardness of water is mainly due to the presence of __. 15. A suitable solvent for iodine and nephthalene is __. 16. Which of the following noble gases is commonly found in the atmosphere? In the reaction above, an increase in temperature will __. 19. How many cations will be produced from a solution of potassium aluminium tetraoxosulphate (VI)? 20. Which of the following is NOT an alkali? 21. An effect of thermal pollution on water bodies is that the __. 22. Which of the following is a deliquescent compound? 23. A chemical reaction which the hydration energy is greater than the lattice energy is referred to as __. 24. The function of zinc electrode in a galvanic cell is that it __. 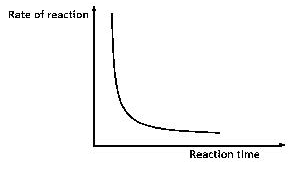 The major factor that influence the rate of the reaction above is __. 26. The condition required for corrosion to take place is the presence of __. 28. 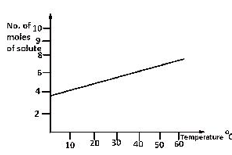 The diagram above best illustrates the effect of decrease in __. 32. The effect of the presence of impurities such as carbon and sulphur on iron is that they __. 33. A few drops of concentrated HNO3 is added to an unknown solution and boiled for a while. 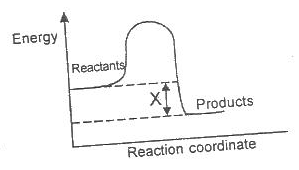 If this produces a brown solution, the cation presents are likely to be __. 34. The bleaching action of chlorine gas is effective due to the presence of __. 35. In the laboratory preparation of oxygen, dried oxygen is usually collected over __. 36. The property of concentrated H2SO4 that makes it suitable for preparing HNO3 is its __. 37. Bronze is preferred to copper in the making of medals because it __. 38. The constituents of baking powder that makes the dough to rise is __. 39. Which of the following compound is used as a gaseous fuel? 40. The ability of carbon to form long chains is referred to as __. 41. Which of the following compounds will undergo polymerization reaction? 42. The compound above exhibits __. 43. An organic compound has an empirical formula CH2O and vapour density of 45. 44. The reaction above represented by the equation above is useful in the production of __. 45. The number of isomers that can be obtained from C4H10 is __. 46. The functional groups present in the compound above are __. 47. Which of the following is a primary amine? 48. Two organic compounds K and L were treated with a few drops of Fehling's solutions respectively. K formed a brick-red precipitate while L, remains unaffected. The compound K is an __. 49. Which of the following statements is true about 2-methylpropane and butane? The reaction above is best described as __.